PPOA was founded in Louisville and it continues to be the main office of the firm. The firm was founded in 1999 by John Phillips, Susan Phillips, John Parker, Bill Orberson, and John Moore, and they were joined shortly thereafter by Marty Arnett. This group of close friends and colleagues had established themselves as some of the region’s finest trial lawyers, and wanted to create a firm based on their common beliefs and ideals about the practice of law. Since its founding, PPOA has grown into one of the largest and most accomplished law firms in Louisville dedicated to trial practice, and our attorneys are routinely recognized as some of the best litigators in their respective fields. 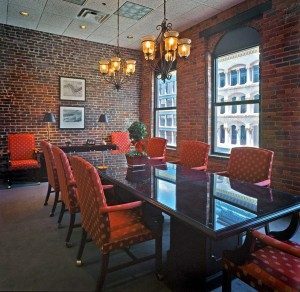 The office is located in downtown Louisville, just two blocks from the courthouse, and in the cultural heart of the city. Our office is located in the thriving Museum Row section of Louisville, surrounded by the Louisville Slugger Museum, 21C Hotel, the Kentucky Science Center, and the Frazier History Museum, as well as many restaurants and other popular cultural options.